It’s been a while since the various parts of Google Apps received a make over. The current look has been with us for some years and looks, looked, noticeably aged. 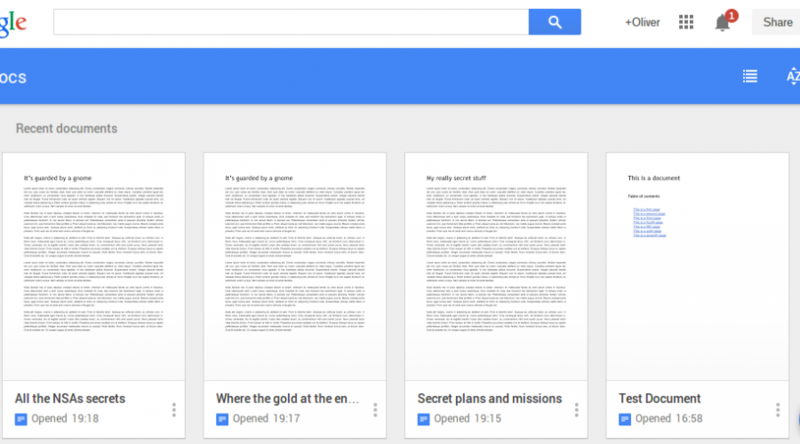 Today Google have launched a fresh new look for Drive, Sheets, Slides and Docs. When you now access Google Docs, Slides or Sheets you are presented with Material Design style dashboard. This presents your documents in a sleek, modern way that really makes the most of large displays. The previous default list view has been replaced by a tile view showing thumbnails of each of your documents and the ordering is dynamic, with recently edited documents being placed first. The old grid view is still there but it’s easily more presentable than before. To create new documents, slides or sheets you can now hit the big + symbol in the lower right corner. You can see from the screenshot that the layout is much more suited to touch screen displays. Perhaps we’ll see a greater number of touch enabled Chromebooks coming out soon. The nav menu has been made more simple with links to Sheets and Slides as well as a link to Drive. Drive has also been given the same Material Design update as the rest of the suite. The new activity pane shows updates and changes to the drive file in a really precise way. Over all the changes here are aesthetic and very inline with the changes to Docs and the rest. However one very useful change is that you can now drag a highlight around multiple files to select them all. Much easier than selecting each one individually.